Change is inevitable but growth is optional. These words apply to not only life but the business world, as well. Just when things are going somewhat smoothly, a key piece of equipment breaks or your tech's vehicle develops a radiator leak. Change just happens and some things are out of our control. Yet growth is optional and we can do something about it. 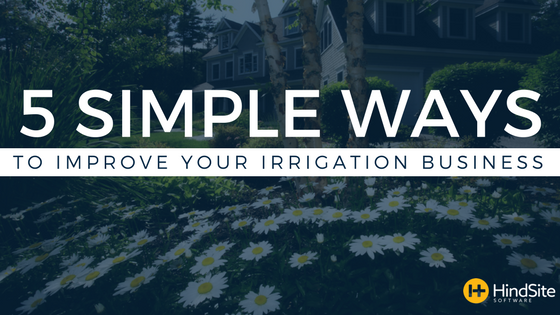 Through focusing on five critical elements, growing the size and profitability of your irrigation business is within reach. Your customer is your most valuable asset. Learn who they are and what makes them tick. Build rapport by learning something about them. Did their daughter just get accepted to the University of MN Medical School? On your next visit, give them a Golden Gopher note pad. What is Mr. Adam’s birthday? Surprise him with a phone call or greeting card. Retaining customers is key to growing your business and people like to do business with friends they trust. And not to do too much self-promoting, but one simple way to keep track of all this information is using irrigation business software. Retain your customers and prospects email addresses. Emailing is a great way to communicate. Use email to remind them of their appointment. Send an offer for added services. Wish them a “Happy Birthday”. Be reliable and they will reward you with more business. Email is a great method to use for your customer referrals. You can reach your customers and keep your brand top of mind simply by being in their space. They are on Facebook, Twitter and LinkedIn so be sure you are too. The more customers that you get to follow you, the more touch points you have with them and likely their friends and family. When properly executed this is an effective way to exponentially grow your customer base. Excessive paperwork and phone calls can create massive chaos in our office. But it doesn’t have to be this way. There’s software out there - including our own - that’s designed to reduce the chaos, gain efficiencies and give you back the time you need to develop rapport with customer and spend more time with the family. It may sound crazy, but we have heard countless stories from our customers of invoices that never were written. I’ve even heard stories from friends who’ve had a contractor do work on their house but never receive the bill. Avoid doing this by integrating software like QuickBooks and Sage50 will help you get invoices out with a few mouse clicks. No more lost invoices and money for you. In fact, you will be delighted to put those old blank paper invoices in the recycle bin. You won’t be needing those anymore.